This Is My Companion Apple | Ooh Something Shiny! 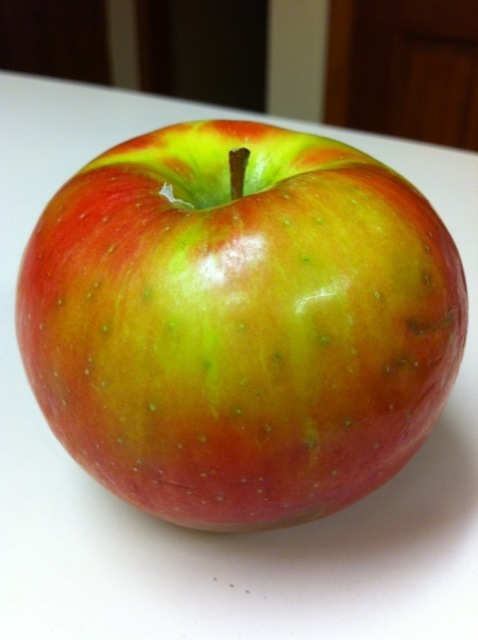 I have been carrying this same apple back and forth in my lunch for a week, but I never eat it. It’s become something of a pet. Every day, I think, this will be the day that I eat my apple, but when lunch comes along, it doesn’t happen. I’m an apple procrastinator. Sometimes it’s just too cold to bite into an apple. Sometimes I’m just not in an apple mood. This is a big apple. A big apple is a big commitment. What if I start eating the apple and change my mind. You can’t go back. A breeched apple is a ruined apple. Parts of the apple may be flawed. Then I have the conumdrum of deciding how close to get to the flaws for the perfect balance of maximum apple usage and mimimal risk of biting into sub par apple. I considered bringing a knife from home to cut up the apple, but I recently purchased some very sharp knives from a college student and end up stabbing myself and bleeding profusely every time I attempt to use them. I have no solution at this point. I may need an apple intervention. Got here from the Bloggess and love! I had a companion apple last week. Eventually it was a little banged up and I realized I was never going to eat it or it’s friends. Now I have a big pot of apple sauce instead! Love The Bloggess. So glad you found me through her. I vote you throw your companion apple at someone that deserves to get hit in the face with a large object. I nominate my CEO.